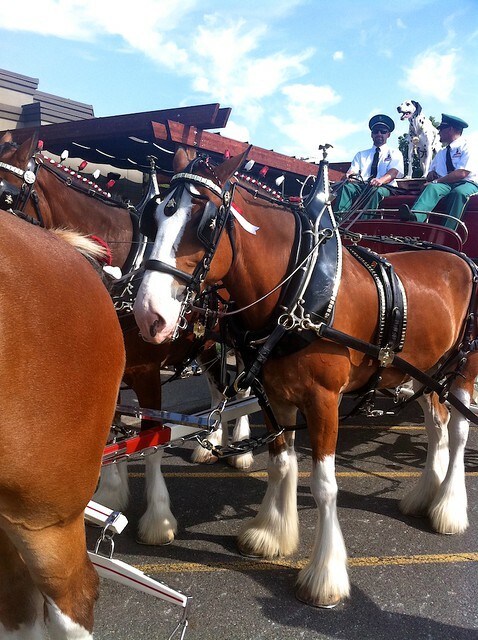 Home Cover Feature A CLOSE ENCOUNTER WITH THE BUDWEISER CLYDESDALES!!! 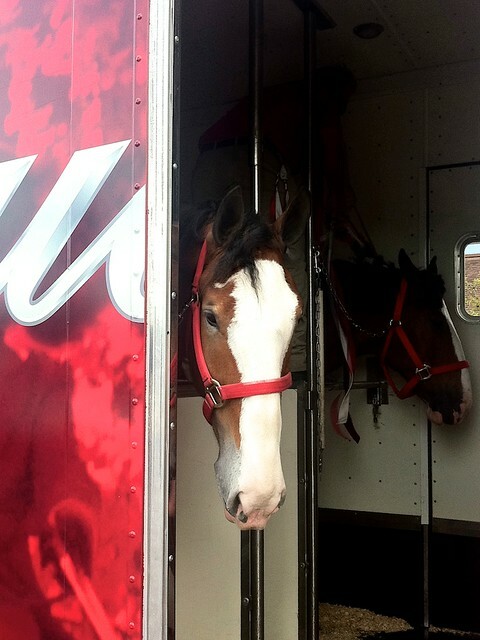 A CLOSE ENCOUNTER WITH THE BUDWEISER CLYDESDALES!!! Wow…talk about a random act of kindness!! 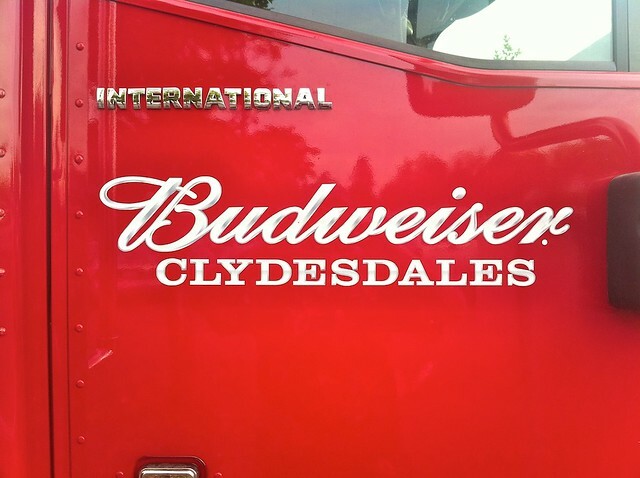 How did this horse handler from the Budweiser team, know how dearly I have wanted to see the Clydesdales up close and personal…seriously, since I can remember I have been fascinated with these cookie cutter giant creatures!!! Well of all things, we were going out for a brewski with one of Steves friends and workmates Bob tonight (thats the back of Bobs head above), and pulled into the Thirsty Lion Tavern which is part of a large mall complex….. and Steve points out there were 3 massive Budweiser horse trailer rigs in the parking lot. We parked and Steve went in to meet Bob while I went over to investigate the horses. The team of 8 were being brought out one by one, braids were being put in their hair complete with ribbons, blinders attached and each walked over to it’s place to be hitched up to the team. 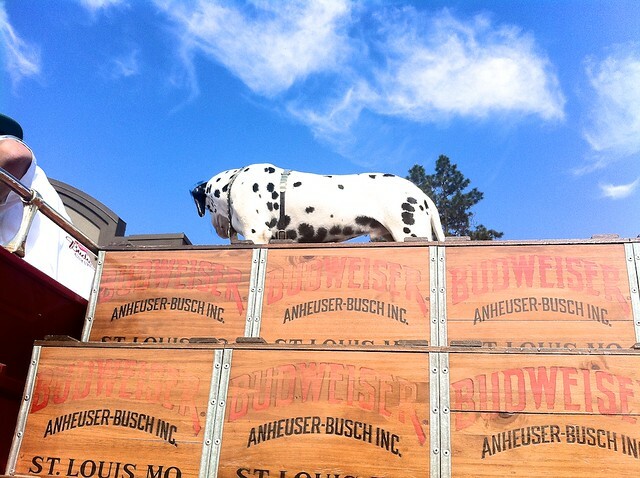 The crowning glory was the dalmation who was lifted up by the team drivers and he took his spot on the beer cases proudly!! 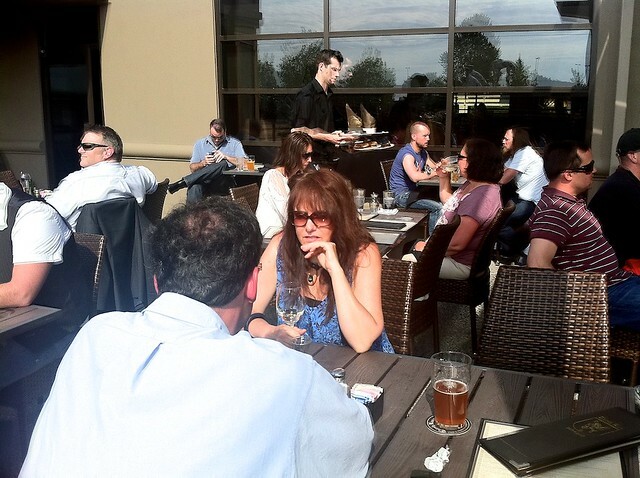 Once the team was ready and the few onlookers took their photos I went to meet Steve and Bob in the outdoor eating area….KICKING MYSELF the entire way there that I didn’t have my camera….not even my iphone which was at home charging. I wanted to cry!!! Luckily Steve and Bob had their iphones and got some awesome photos for me!! Thanks boys!!!!! 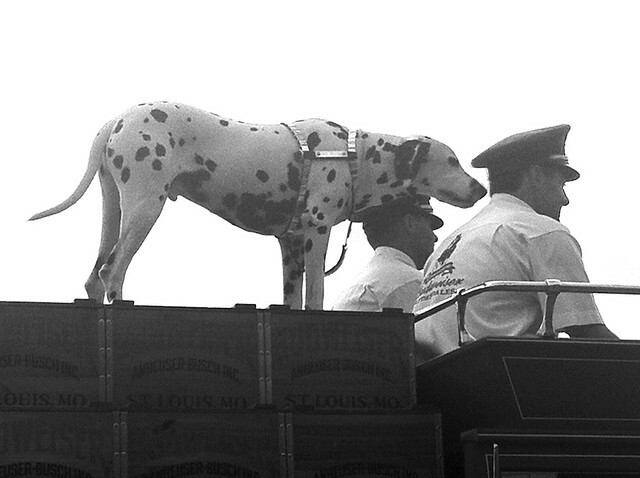 The dog was in his element up on the beer wagon. The drivers fed him treats and gave him water really often and he was smiling the entire time! The wagon was really beautiful. The entire team looked like a picture postcard to me. The stuff a little girls dreams are made of…horsies with braids in their hair!! 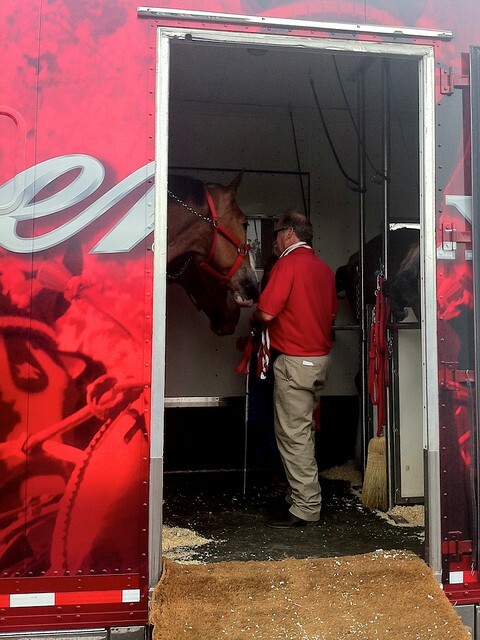 When we were done eating we paid our bill, said goodbye to Bob and headed out to our car, but not without one last peek at the Clydesdales who were being put in their trailer for the evening. The handlers were taking out their braids, roses and ribbons very methodically and neatly and patting the horses for a job well done. 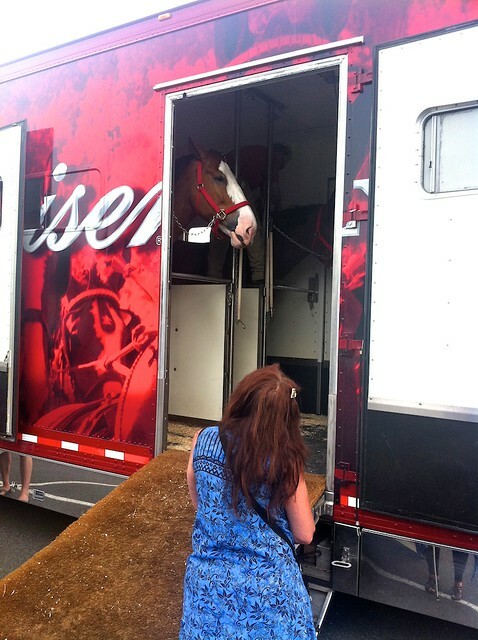 I stood looking up into one of the trailers talking to Jake…one of the giant beauties and told his handler how beautiful his horses are and in such gorgeous condition….we moved onto the next trailer to say goodnight to the other horses. Out of the blue, the handler from the first trailer comes over to me and says “can you walk up the ramp” (I had my blind cane so he didn’t know how much I could see). I said OH YES…..and of course could hardly hold back the tears. 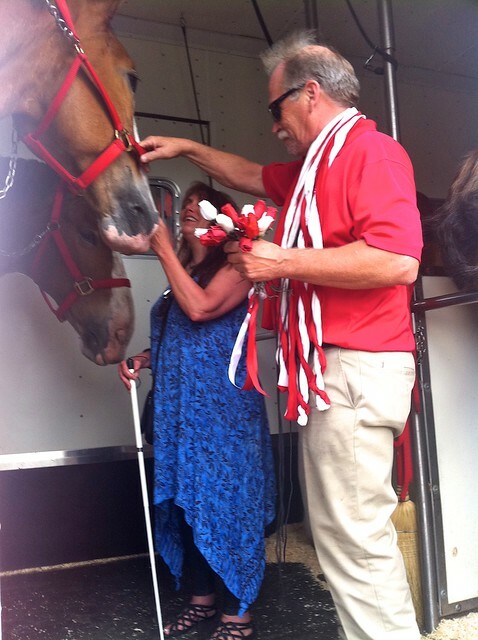 He introduce me to the two horses in that trailer, and took Jakes ribbons out of his mane and handed to them to me. I wish I could remember the other horses name and the handlers name. I was just so taken by surprise. The horses make such intense eye contact …it was awesome!! I gave the horses lots of luvin and pats on the nose and they were so gentle and HUGE. It was time for the Clydesdales to go to bed so I had to say my goodbyes and gave the handler a massive hug. I think I took him by surprise just like he did to me!!! Talk about making this lady happy. I will never forget that kind gesture and the experience with these majestic creatures!!! Hi Sandra, I have not been around much on the net since we shared a panda, but try to always read your graffiti. I have enormous love and respect for all the heavy horses and the Clydesdales are such wonderful gentle giants, I used to ride one of two Percheron’s bare back as a child and these sweet horses put up with us and took us round the fields where I lived. I don’t see the heavy horses much these days but can never forget my nostalgic memories. WHHHOOOAAAAA:) How cool is that—maybe it’s good that you didn’t have your camera—you could really concentrate on the animals and let someone else do the clicking. So happy for you girlfriend! I don’t post very often but I just had to comment here. This was such a lovely experience for you & I sat here with tears running down my face as I read this. I grew up with horses & even rode competitively in horse shows. Haven’t been on a horse in more years than I care to admit but I still have a real love & fascination for these wonderful creatures. Gainesville is “horse country” & I am thrilled to have horse farms all around me. What would really make me happy would be for some handsome horse person to come into my life, sweep me off my feet & allow me to have Fresians. I was crying, too, Pat…Tom wanted to see so he stood behind me looking at the photos as I tried to read. I kept tearing up, and the screen was blurring out. We both loved it!!! 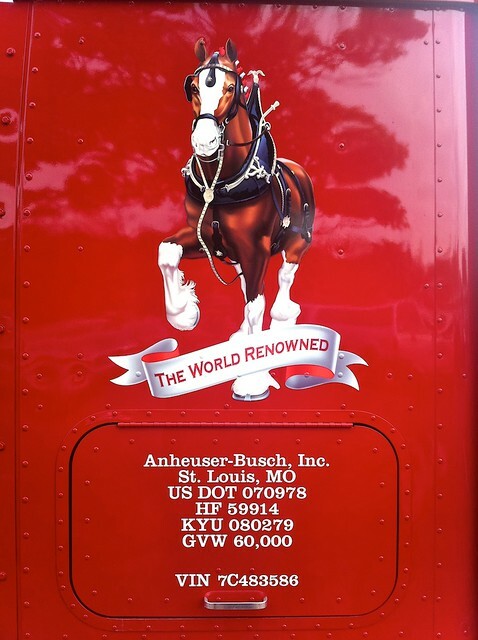 Being an old Missouri girl, I also grew up with the Clydesdales, but maybe at a closer range. They are wonderful animals, no doubt! Sandy, what did you “get” the horses were communicating to you as they looked you in the eye? You guys, I am SO touched by your comments and am so envious of those who got to grow up with horses. I don’t know if my own family knows my deep love for horses since I have only ridden one a couple of times as a teen and the dogs were always what my life was centered around being a show person from age 10. I have been thinking after reading all your wonderful comments why I am so much more horse crazy now than I was even 5 years ago, and think I have figured it out. The Elephants in Thailand I’m sure are the reason!!! Even though I have always adored horses from afar, I have had a healthy respect for their sheer size and power and even a real hesitation around them…….just like the Ellies! A huge part of why I wanted to go to Elephant nature park in the first place was to help me overcome my hesitant nature with huge animals. I adore them so much and I hated having reservations about being close to them. Well the ENP did the trick and now I’ve held, hugged, kissed and admired up close, everything from pandas to ellies. 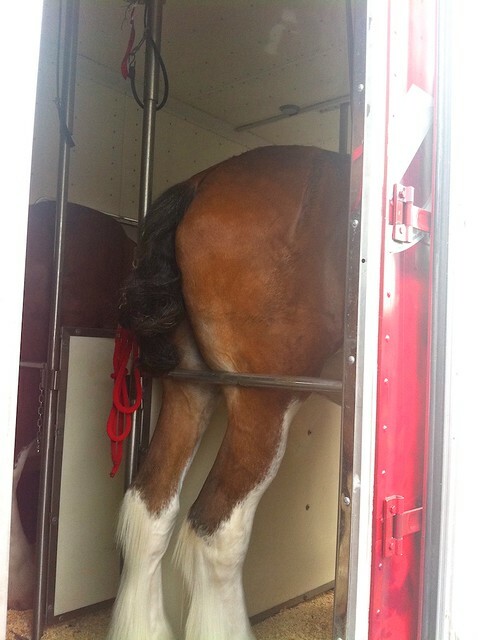 I am also now very comfie around the draft horses and I am sure this is a big reason why….thank goodness. The next thing on my list is to go visit the Gypsy Vanners in central Oregon!!!! Jan those eyes……….Jake locked eyes with me and just pulled me in. I started talking softly to him and he kept nodding his head and twisting his ears to liisten. I told him what a handsome man he is and how he makes so many happy..it was about then when the handler asked if I wanted to go in the trailer to see the pair. I wonder how much he heard….lol..he really took me by surprise! Diana, I think you are right…I would have been too busy taking pix that’s for sure!! I was shocked at how nice the iphone pix turned out with a little photoshop tweeking. the Dal on the cart was my fave…….so crisp and incredible color! Thanks Steve!!! What an opportunity Sandy! We saw them today too – had front row seats in the VIP section since the DUCK was the “grand marshall”. 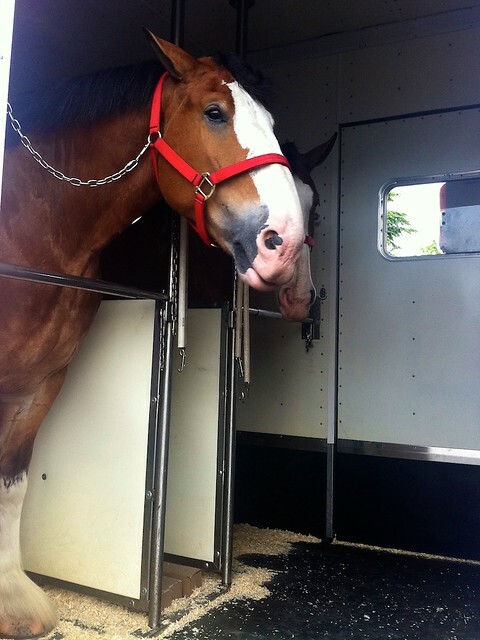 It was worth it just to see the Clydesdales – how tall do you think the biggest 2 were? They were so perfectly matched – an awesome sight to be sure. J.
oooooooo……this is just my idea of “wonderland”! I saw the Clydes at the Fair one year, up close and personal and did not have a camera. never thought to bring one, and had no idea i would be seeing these beauties. 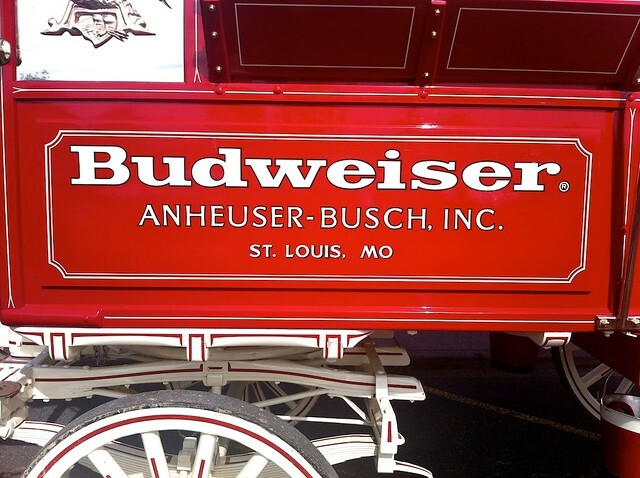 I have a few of the Old Budweiser Wooden beer cases from my brother in law in Missouri…they are so cool! I also grew up with horses in the family. My two great uncles, farmers, had two huge draft horses, the first i ever rode, and my legs stuck straight out on each side as their backs were so wide. then my moms cousins decided to get into showing arabs, and that was another chance to spend time with horses as they lived quite close. i adore the strange beauty of these big animals…..their muscles moving under the sheen of their coat! Im so happy you got to have this really incredible experience! I miss horses now!!!! must go to a horse show!!! Jan how FUN!!! In all the years we have been in PDX we have yet to attend the Rose Parade!! Thats just WRONG!! Sounds like you had the best seats in the house!!! I was shocked at how big they are and that was my first reaction is they were perfectly matched. I wondered how many didn’t make the genetic “grade” so to speak for one of the Bud teams….how consistently do those markings come up that similar………….the dog breeder in me thinking….lol! Hey Kathe!! How have you been? Oh how lucky to have a close connection with horses. They are really special creatures……not like any other domestic animal in so many ways. I am crazy for all draft horses….we had friends with Percherons in Minnesota, but never got very close to them. My next thing on my list is to visit those Gypsy Vanners in Oregon. Oh it’s always when you don’t have the camera that you wish you had it!!! Makes me crazy!!! I stood in that parking lot with the late afternoon sun sparkling on the horses and their finery for over an hour just kicking myself……thinking of every shot I could be taking!!! You just brought to mind another true love of my life!!! I grew up with horses in ranch country, and continued to ride until I went away to college. (My parents said my horse had to stay home) We owned quarter horses which were breed to thoroughbred mares for their grace and agility. These pics brought back some of the happiest memories of my youth, and the touch of their noses is truly like velvet!! Thanks for sharing!! !